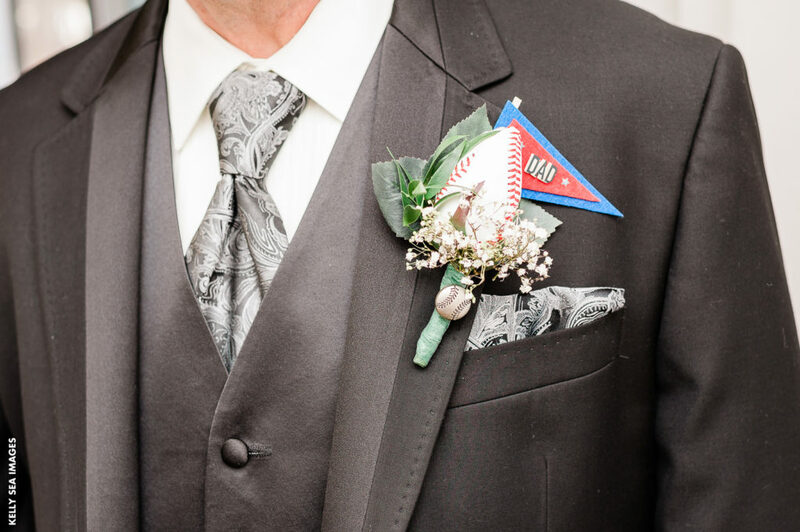 He loves sports and perhaps you do too, but you’re a bit hesitant about how to incorporate your love of your team into your wedding day. 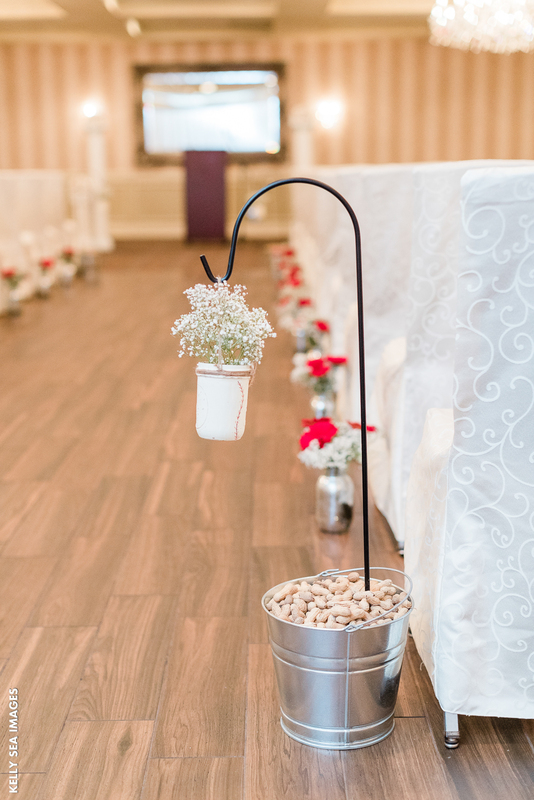 Maybe you always pictured your wedding as being something elegant, traditional, and timeless, yet, you feel that adding football, hockey, basketball, or baseball would ruin your vision. 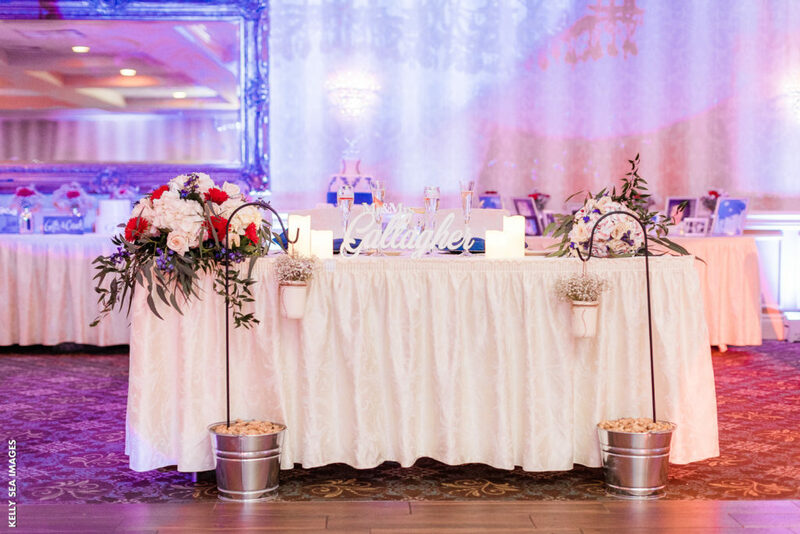 The truth is, you can combine the love of sports with the wedding vision just as this couple did right here at Sterling Ballroom. 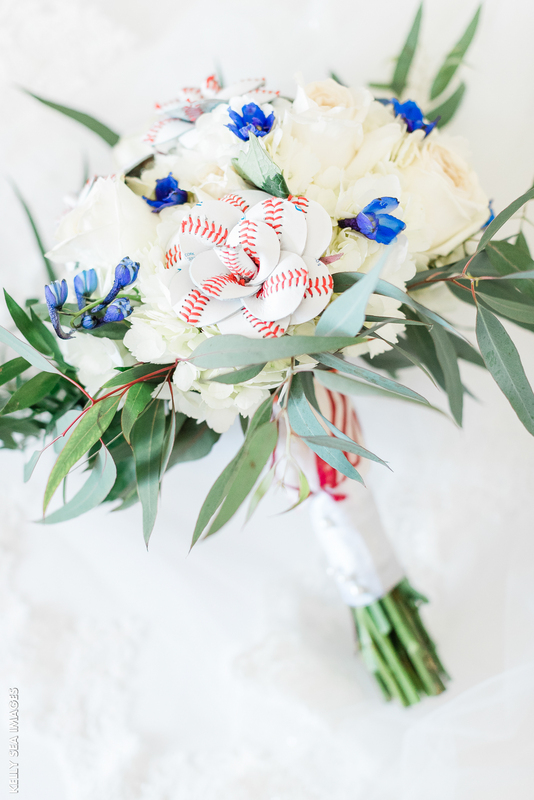 Though this wedding had a baseball theme throughout, you’ll notice that the bride, groom, and bridal party all wore traditional, elegant, attire to their wedding ceremony and reception. Just because you’re going with a sports theme doesn’t mean everyone has to wear cleats and jerseys. 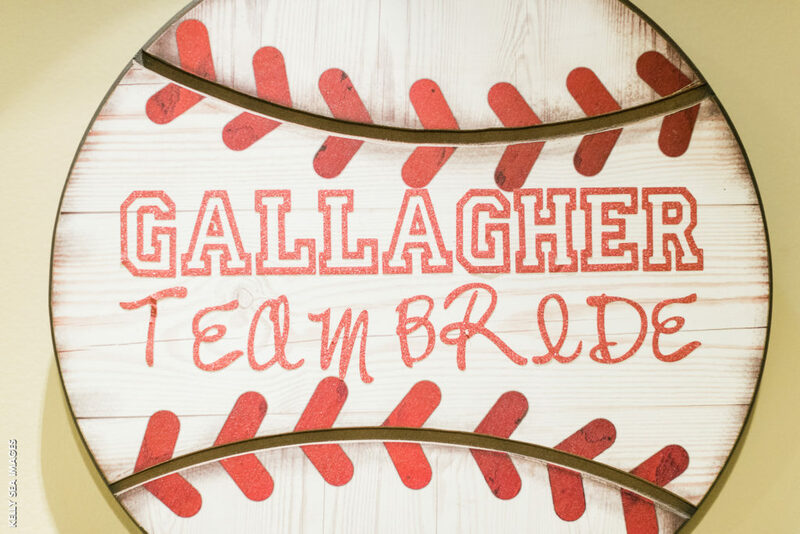 Sports are all about competition and this couple did a good job of making it fun and friendly by having a team bride and team groom. 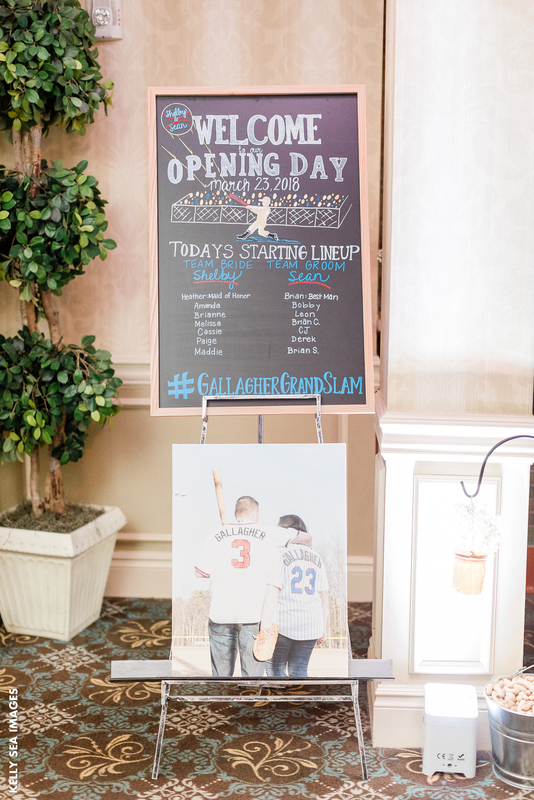 The signage was creatively put together to keep the competitive spirit going throughout the wedding and reception. 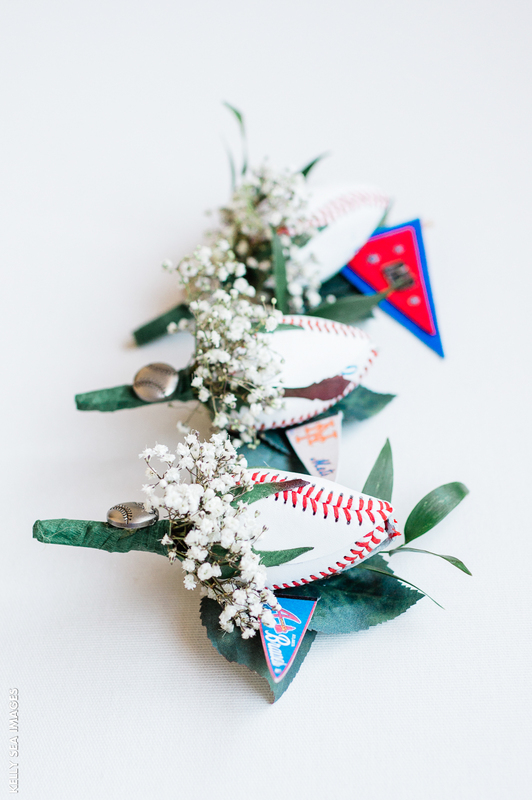 You can add small hints of your favorite sport or sports team throughout your wedding accessories. 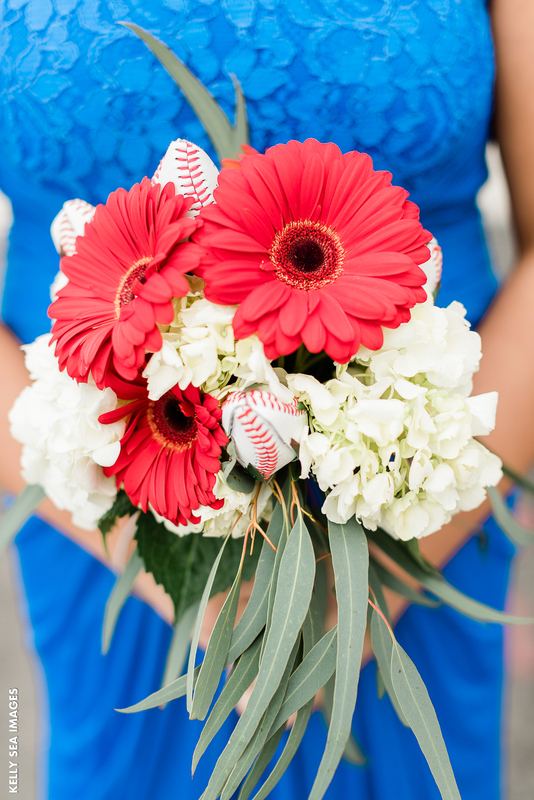 If you look closely at the bouquets of flowers and boutonnieres above, you’ll see that there are some flowers and petals in the shape of baseballs. 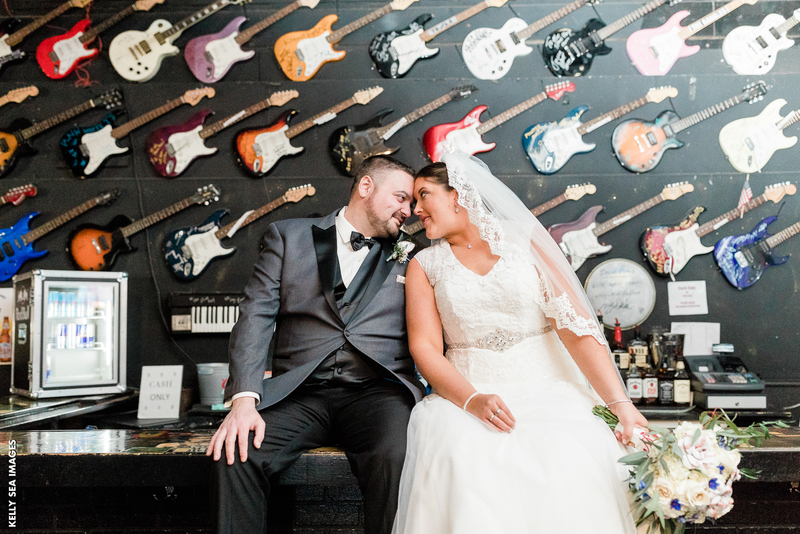 When it comes to meshing tradition and elegance with sports this couple didn’t stop at subtle hints in their attire, they also incorporated it throughout the decor. From the pails of peanuts used as wedding aisle decor to the green turf, gloves, and baseballs in the centerpieces for the reception, combined with beautifully colored flowers and lighting, this was some out of the box designing. 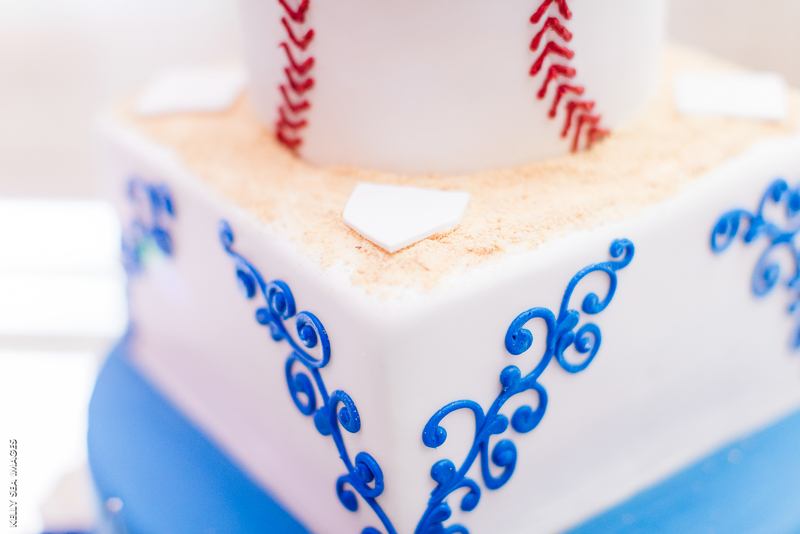 Wedding themes tend to transcend into the cake as well. 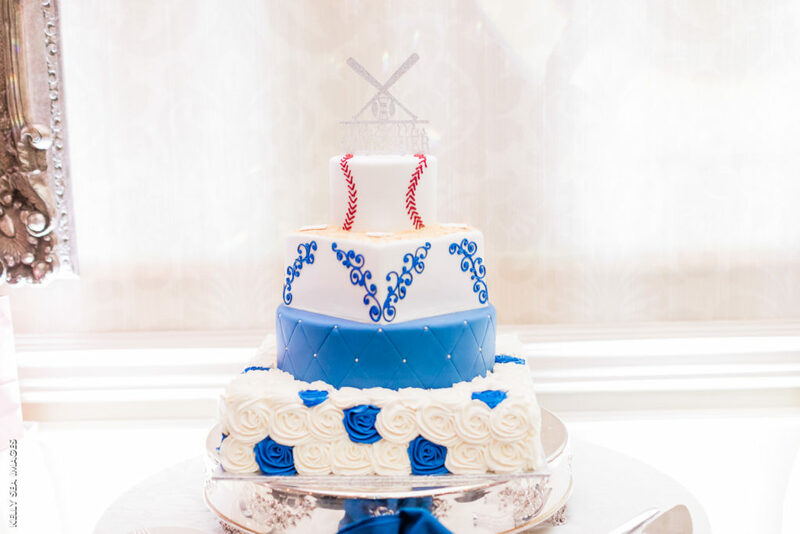 Though this couple chose to go with a killer combination of a multi-tier cake with a baseball pattern and elegant blue flowers and patterns, you can also opt to go with a grooms cake where you allow the groom to incorporate his own team or sports theme. 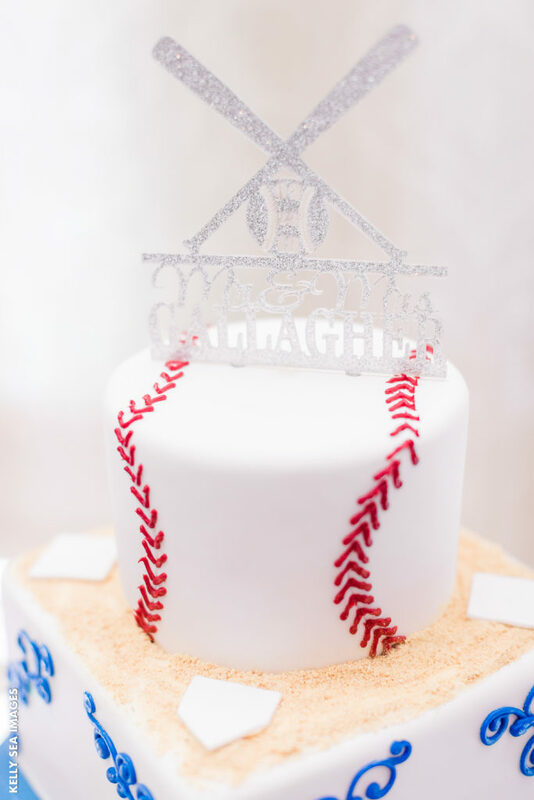 Whether it’s the bride, the groom, or both that love sports, there is certainly a way to incorporate your favorite team into your special day. 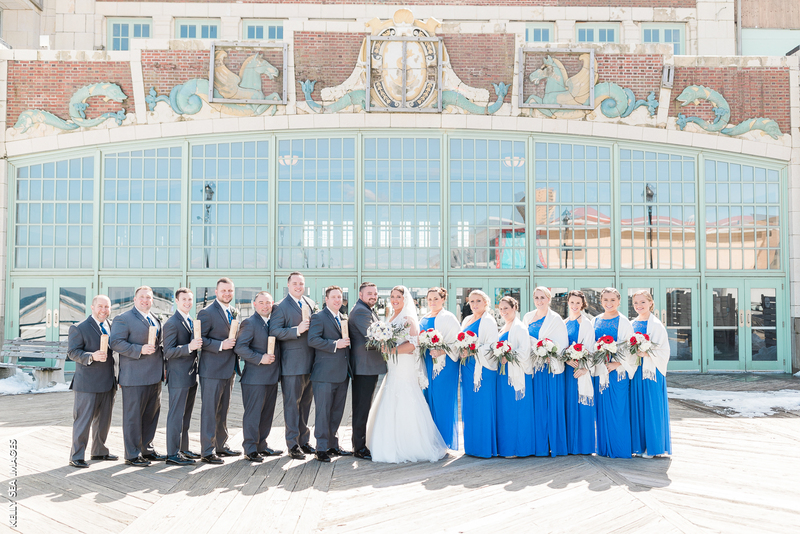 As you can see from the example above, this couple was able to find a way to stick with the theme while keeping it classy, timeless, and traditional. 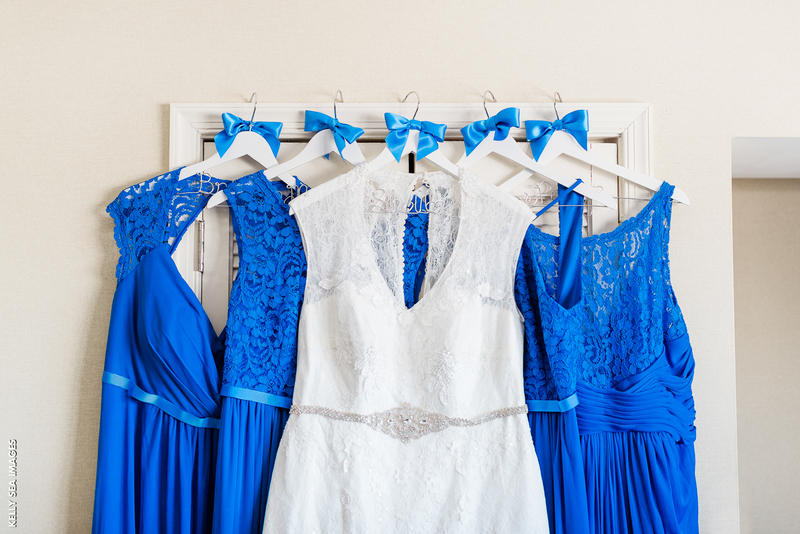 Hopefully, this has given you some inspiration on how to create the vision you want for your wedding day.